Introducing the latest product innovation from BAL to meet the needs of RVers: the new BAL "C" Jacks, combining the strength of a leveling jack and the steadiness you get from a stabilizing jack. Designed for use with travel trailers and fifth wheel trailers, there's no comparable product like the "C" Jack. Available in 19", 22", 25", 28" & 31" extension and shipped in a boxed set of two with crank handle. BAL "C" Type Stabilizers are designed to mount to the trailer frame where the crossmember meets the main frame member. New, highly engineered, low-profile design yields a light weight, high strength, low cost product that is aesthetically pleasing and highly functional. High strength allows for stabilizing increased loads and fine leveling. Rapid extension provides quick activation of both up and down movements. Integrated foot makes for secure, increased ground contact to prevent slipping or sinking. Advanced, corrosion-resistant finish assures years of dependable use. 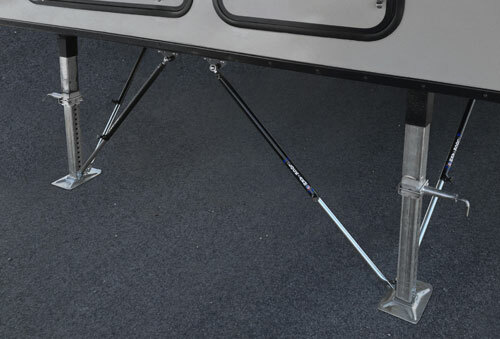 Eliminates most trailer movement associated with existing leveling or stabilizing jacks. Adapts to most crank down leveling/stabilizing jacks. Installation is a simple one time, bolt on application. Unique swivel mount works at various jack angles. Telescopic Lock-Arm travels up and down with jack for easy set up and storage. Uses ¾” crank handle to lock and unlock Lock-Arm. Two Lock-Arms and complete mounting hardware include. Your Scissors Jack or C-Jack can be powered with an optional 12-volt motor kit, providing nearly automatic stabilizing at the push of a button. Light weight, high rpm and easily installed, this sealed motor has easy access to manual override and is packaged in a boxed set of two with motor control. The power pack is designed to quickly lower the jack to the ground, or raise it back to the closed position. Using the motor to lift a vehicle may cause damage to the motor and/or jack. Jacks not included. WARNING: For use on stabilizing jacks for travel trailers and 5th wheel campers only. Do not use the Power-Pak on any application other than the intended use specified by BAL. Please contact BAL for any clarification before purchasing. If there is no crossmember at the desired mounting location, you may use the connecting channel to support both jacks. dirt or sand. 2 per box w/ bolts.